Imagine standing on a never ending deserted beach with the warm waters of the pacific ocean washing your feet and the sun just raising over the distant hills. 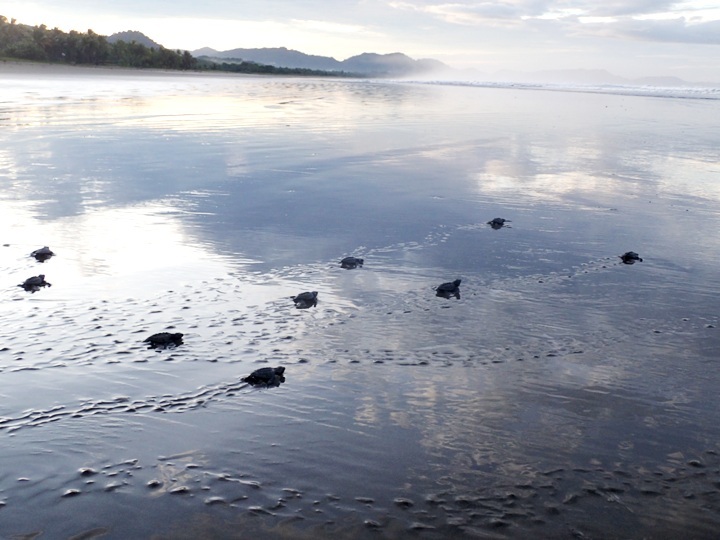 Sounds to good to be true but this is just what it is like on the turtle conservation project in Costa Rica. This was the time you would release any early morning hatchlings and watch as they all raced off towards the sea what a fantastic sight and I still find it hard to believe I was part of it. As the village consisted of really only one street with a row of houses there was little to do there except relax during the day or swim. You could hire out surf or body boards for a few dollars which was fun. I had my first go at body boarding which was such a laugh. Also took in a couple of local trips – one to a butterfly farm (the fun was getting there in in the back of what appeared to be a converted golf buggy) and then one for a walk in the forest – unfortunately the only wildlife we saw was an owl but the cool forest and the waterfalls were a great change. The main activity occurred late evening and overnight where we were divided into shifts. These might have just been to check on the hatchlings and count and release any new ones or to patrol the beach looking for any laying turtles or their tracks. Once we found one we would then look for the nest and count and collect the eggs and then on returning to the hatchery rebury the eggs at the same depth. It was fascinating watching these fairly cumbersome creatures carefully dig out the nest and then proceed to lay in the region of 100 eggs before covering them up and concealing the nest before returning to the sea. On the odd night there were no nests to be found but on others you could have 4/5 just on your shift but no matter how many times you walked up and down that beach you were never tired. During the early afternoon we all mucked in to clear out the old nests and check on the status of the eggs that had not hatched noting any details for the records. Sometimes the local children would come to help and then afterwards we would help them with home work or play games and even with my limited Spanish we all had a great time. All the time I was there I was always amazed and excited when I found new hatchlings or saw another turtle as they are just such wonderful creatures and this trip will remain as one of the best I have ever had. So very glad I went. To find out more about Helen’s turtle conservation adventure, visit our turtle volunteering website.